There are certain bites of this cereal that taste like delicious gingersnap cookies with a dusting of cinnamon and spices and a few choice cashews. Other bites taste like pungent, raw ginger root and not much else. The discrepancy between those two types of bites is harsh, and it grates on your taste buds the same way a glob of horseradish might after a few pleasant sips of root beer. 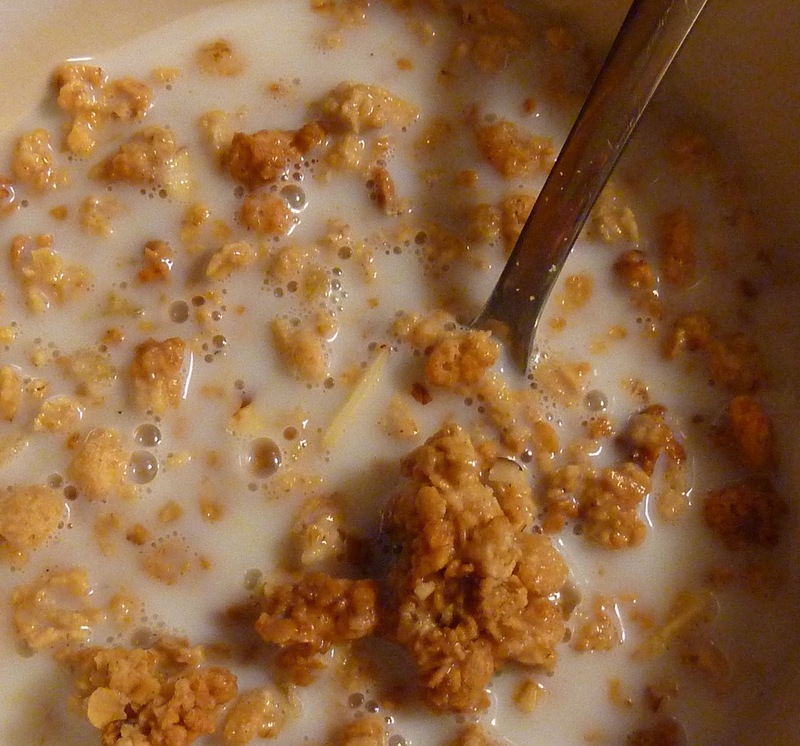 avoid while eating the cereal since each ingredient is more or less the same beige-ish color. I suppose one could inspect each spoonful meticulously before shoveling it down, but it would take a great deal of time, care, and effort to do so. 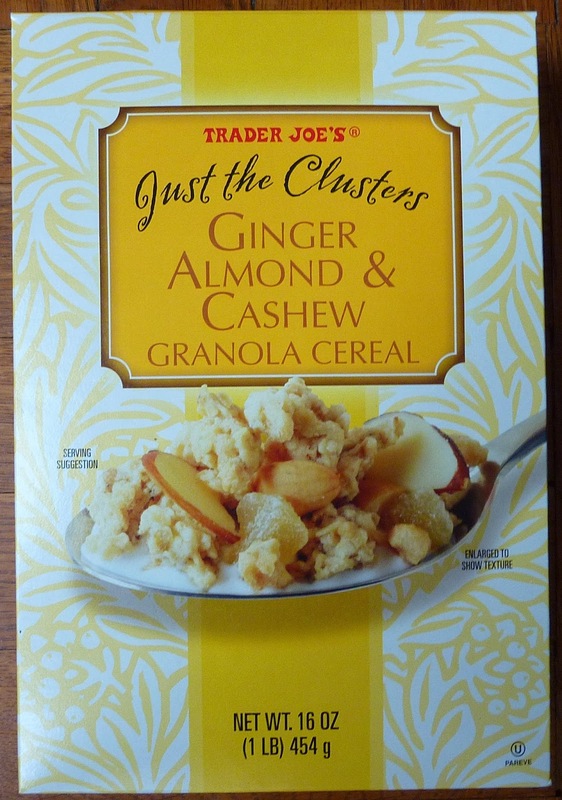 It's much easier to make the following generalization: The only people who should consider buying this cereal are people who are madly in love with the taste of raw ginger. I was skeptical when I saw this box on the shelf. Could ginger really work as the centerpiece in a breakfast cereal? The Ardmore, PA Trader Joe's was a madhouse on my last TJ's run, and it provided the kind of full-contact shopping experience I hadn't seen since I braved the hordes of colorful characters at 3rd and La Brea in L.A. There wasn't much time to linger there in the aisle staring up at the cereals, and much like my last review, I made a hasty decision. I'm a fan of certain ginger products: ginger beer, gingersnaps, ginger ice cream—and even ginger wontons. But when it comes to ginger candy or raw ginger root, that's where I draw the line. As a spice, ginger should be used sparingly. It's simply too pungent when it shows up in abundance. Sonia liked this cereal even less than I did, pointing out that the bites with excessive ginger kind of ruin all the other bites. That stuff lingers. She only gives this breakfast cereal two and a half stars. I think I'll be slightly more lenient and go with three since there's definitely some potential here. I think this could be a really decent cereal if they toned the ginger down a couple notches. It amazes me the amount of sugar in some of TJ's products... this one is a definite turnoff.. Not just the sugar, but just the name of it makes me walk away. I've noticed with other TJ products involving ginger...overload. The ginger snaps...I can barely eat one of them as that overpowering ginger taste (yes, I know they are called ginger snaps) is too much for me. More for me! My husband and I love this stuff, but we're admitted ginger-freaks. I'll agree it's very strong, but I haven't noticed it being inconsistently strong. I hope they don't change a thing about it! One application if you find it too overbearing as a cereal is as the crunch or crumble part of a fruity dessert - it'd be delicious topping baked peaches, apples, berries... mmmm. It's really a matter of taste, isn't it? My wife is a superb cook, who happens to be Thai. I am definitely not the person to ask if something is too spicy, but I positively dislike ginger snap cookies. This stuff, once I got past the first bowl, is addictive. Truly, truly addictive. My mouth delights in it. I buy the stuff in lots of 6-10. Sugar be damned, it's the overall diet and mine is good and this is part of it. I put Nutrasweet in my tea as a concession elsewhere. I LOVE this cereal because of the tiny bursts of ginger!I agree with the previous reply that it is a delightful experience to eat a bowl of this. I usually by 2 boxes at a time so I don't run out. The ingredients list crystallized ginger so if you don't like crystallized ginger you won't like this.